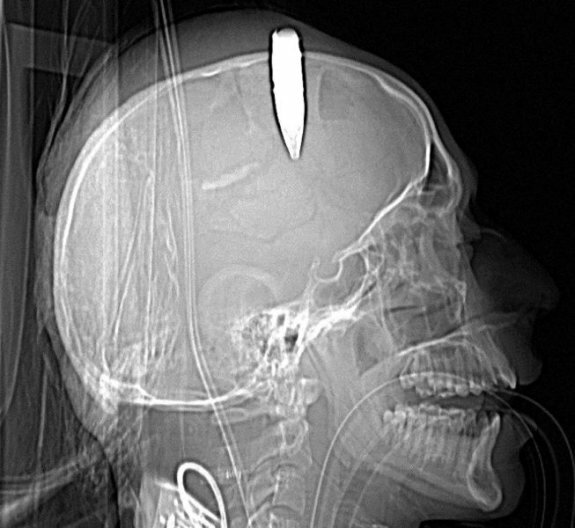 This X-ray shows a 14.5 millimeter live round of ammunition lodged in the skull of an Afghan soldier. 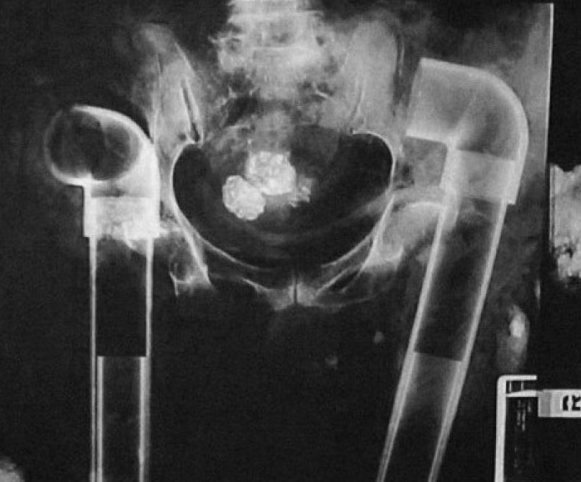 A U.S. military doctor successfully removed the unexploded round -- more than 2 inches long -- at the Bagram Air Field hospital in Afghanistan in the fall of 2014. Notice the life-saving medical tubes placed in his mouth and throat. 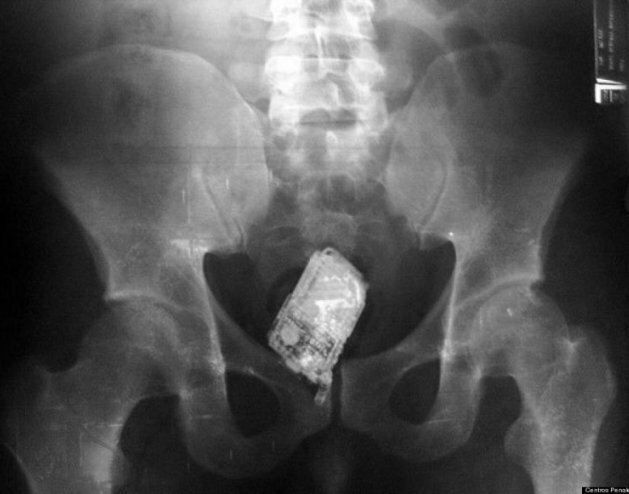 Cell phones were found in the intestines of four prisoners in El Salvador's maximum-security prison, authorities said in September 2006. 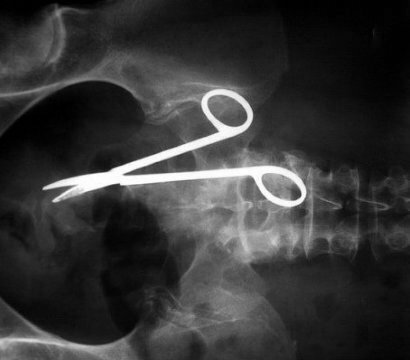 Suspicious prison officials took X-rays of each of the prisoners. 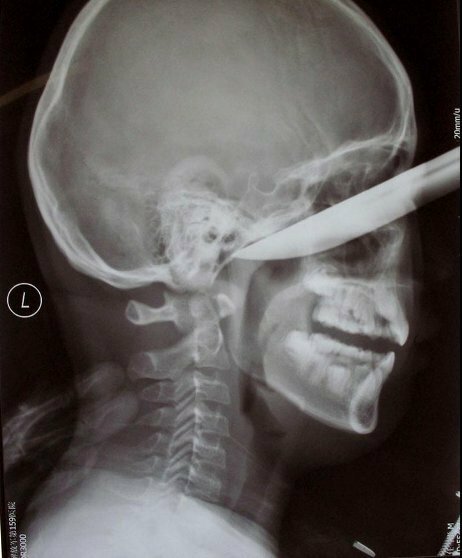 A stunning X-ray image shows a knife stuck deep inside a Chinese teenager's cheek. Ren Hanzhi, 13, tripped and fell while peeling an apple -- jamming himself in the face with a nearly 8-inch knife on Jan. 31. Amazingly, the blade did not strike the boy's brain and doctors were able to remove the knife, expecting him to make a full recovery. 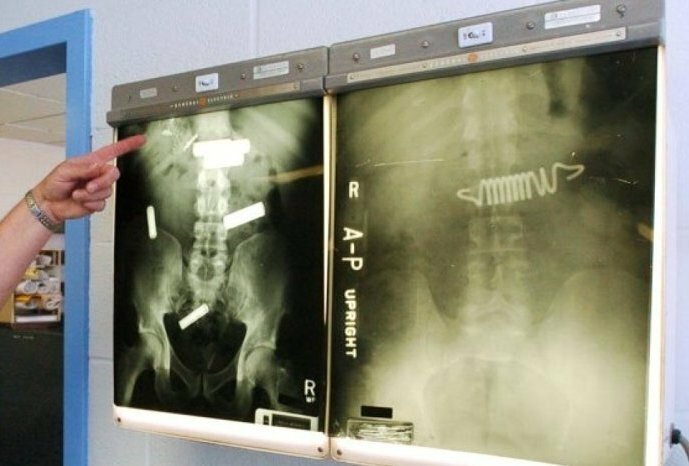 X-rays from Central Prison in Raleigh, N.C., on display in May 2006 show items such as bed springs and batteries that prisoners swallowed to gain trips to outside hospitals. 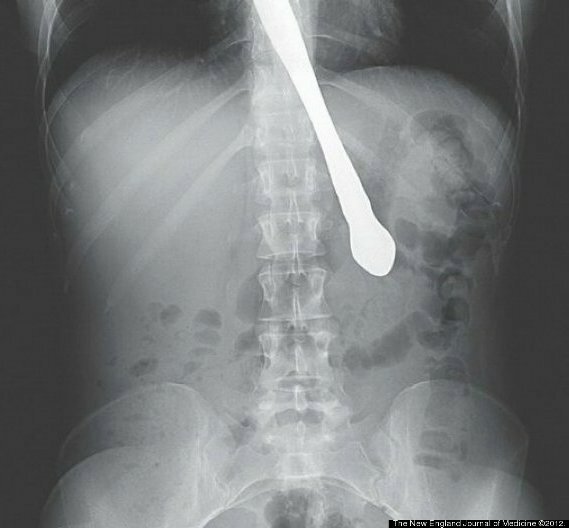 A 30-year-old Atlanta woman with a history of bulimia swallowed a knife while demonstrating that she no longer had a gag reflex for friends, according to the New England Journal of Medicine. 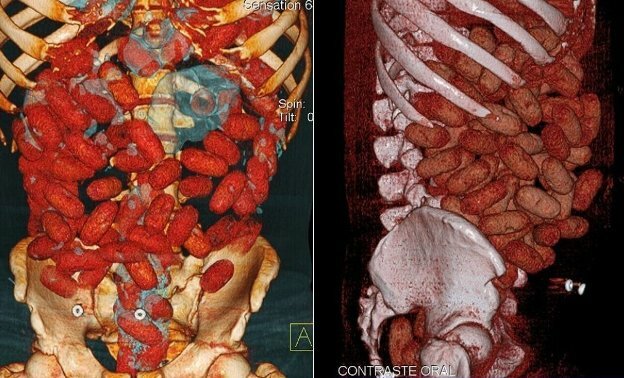 CAT SCAN: In this Monday Sept. 12, 2011 image of a CAT scan released by Brazilian Federal Police on Sept. 16, 2011, bags loaded with cocaine are seen inside the body of an unidentified man after he was arrested at the Congonhas airport in Sao Paulo, Brazil on Monday. 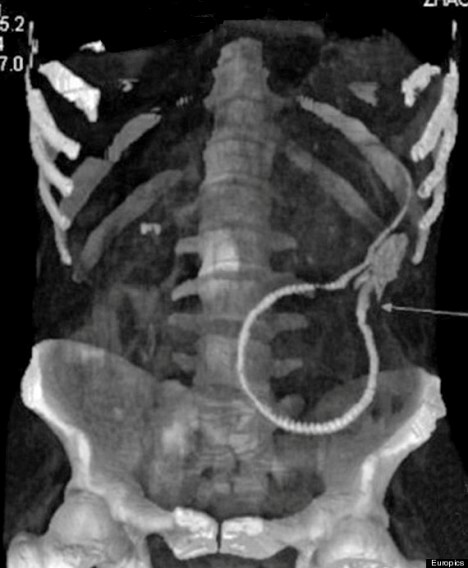 According to a federal police press release, the man is identified as a young Irish male who tried to board a flight to Brussels after swallowing 72 capsules containing a total of 830 grams. 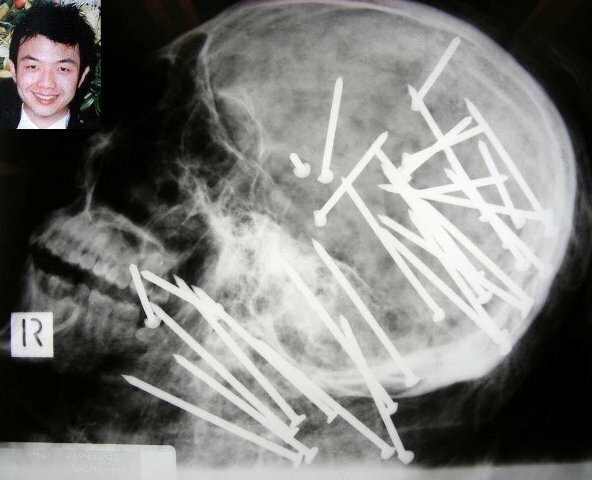 Police in Sydney, Australia, released this X-ray of the skull of Chen Liu, 27, who died after being shot in the head with a nail gun 34 times in an act of murder. Liu's bound body was found in a river in November. The photo was released as part of a public plea for more information in the case. Liu is shown on the upper left in an undated photo. Brooklyn District Attorney's Office: A film released in February 2006 shows PVC plumbing pipes put into a deceased person as part of an alleged body parts ring. Several people were charged in the case. 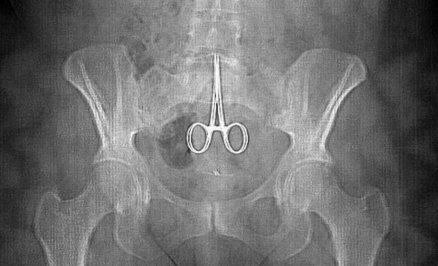 Below is a surgical intrument accidently left in a body after an operation.